Matthew Gray Gubler, TV's Dr. Spencer Reid on CRIMINAL MINDS, will lend his voice to a new character in the next DC Universe Animated Original Movie. It is based on DC comics 12 issue comic book series, "All Star Superman." The award winning series was written in 2005. 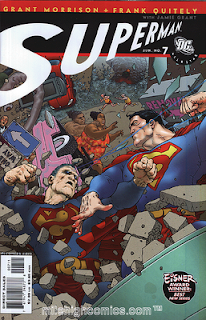 The premise of the comic book follows The Man of Steel as he is oversaturated by radiation during a rescue mission near the sun, accelerating the degeneration of his cells. Knowing that he has a limited time before he dies, Superman sets out on a journey that sees him revealing his secret identity to Lois Lane. In addition to Gubler, voices in the film are James Denton, Christina Hendricks, Anthony LaPaglia, and Ed Asner. "All Star Superman," the animated feature, will be available in Spring 2011. Matthew Gray Gubler was also the voice of Simon in two "Alvin and the Chipmunk" movies, and he is featured in Disney's latest animated film, "Tangled," coming November 24.